I’ve seen necklaces like this before and have always wanted to try to make one myself. Unfortunately, my first attempt at it didn’t go too well. I had essentially finished the necklace but when I put the clasps on and tried it on it was uneven and didn’t lay flat. I tried to fix it but ultimately decided that taking it apart would be the best bet. Ziploc bags and a metal bead scoop definitely came in handy! 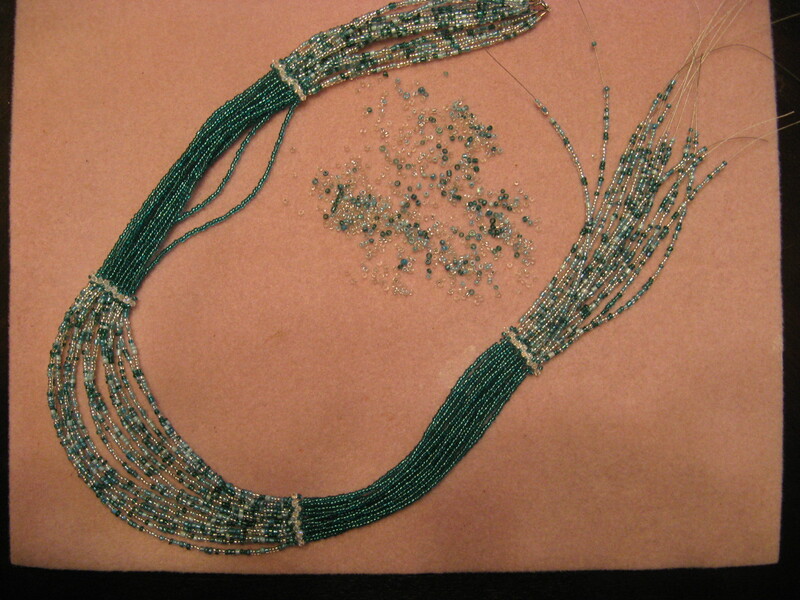 On the second go around I decided to count the beads as I put them on the beading wire to ensure that it would be even. On my first attempt I did each section my measurement, which was probably the downfall in the design in the first place. 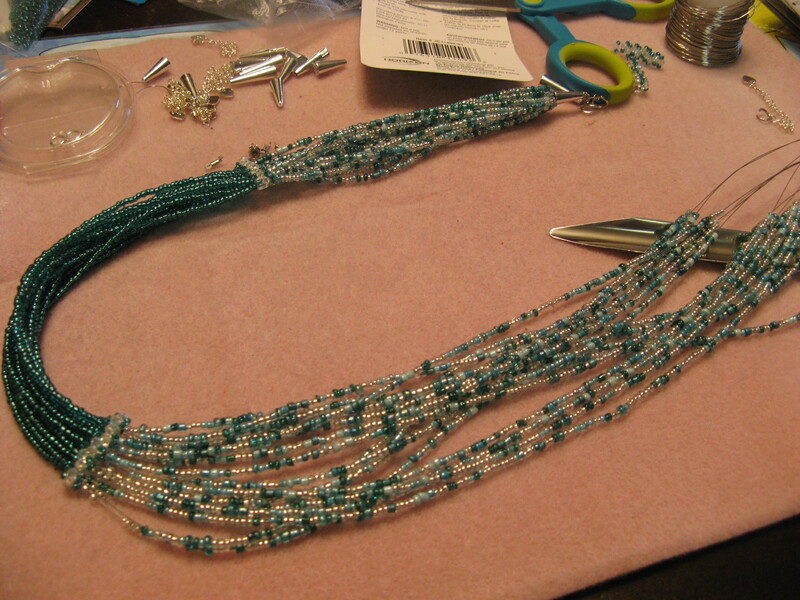 Believe it or not, by counting the beads the necklace came together a lot quicker. This necklace was definitely a learning experience. 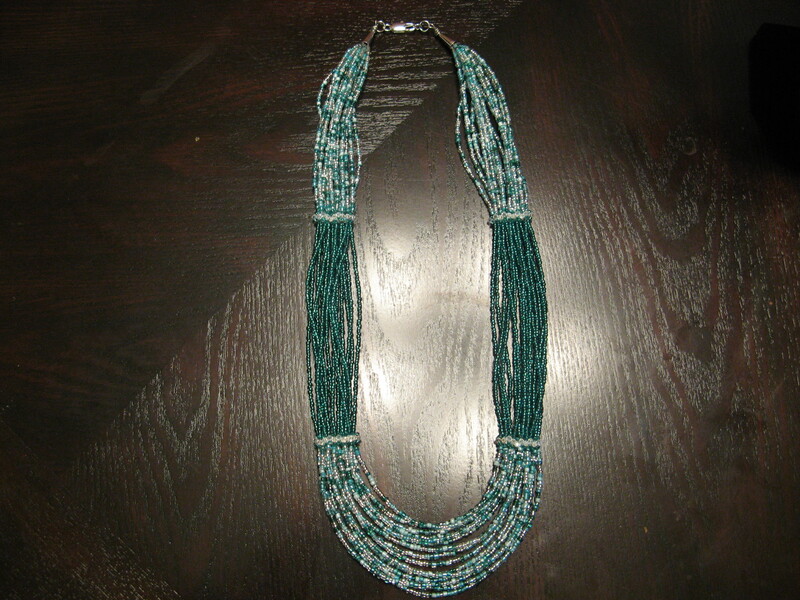 I’ve done multi-strand necklaces before, but not anything as elaborate as this one. 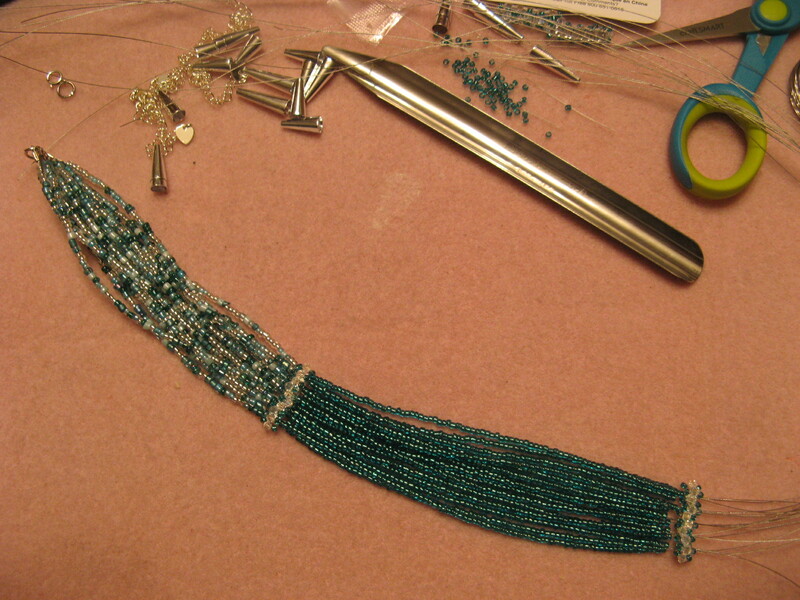 I had to learn how to properly attach a bead cone to the ends to cover up all the crimp beads that were holding each of the 15 strands to a jump ring and also remember to stagger the strands in the middle portion of the necklace so it would hang nicely. Now that I have somewhat mastered the technique I will definitely be making more of these. 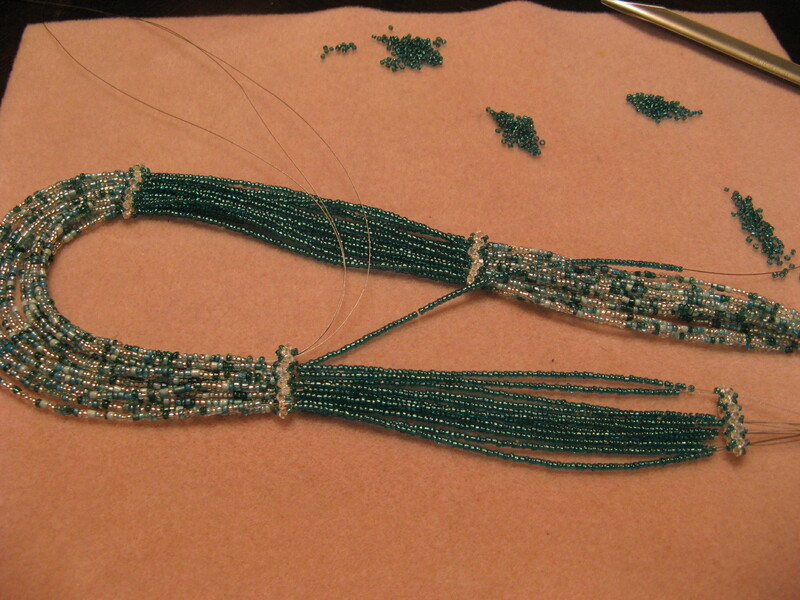 FYI: The beads are all glass seed beads in size 11. 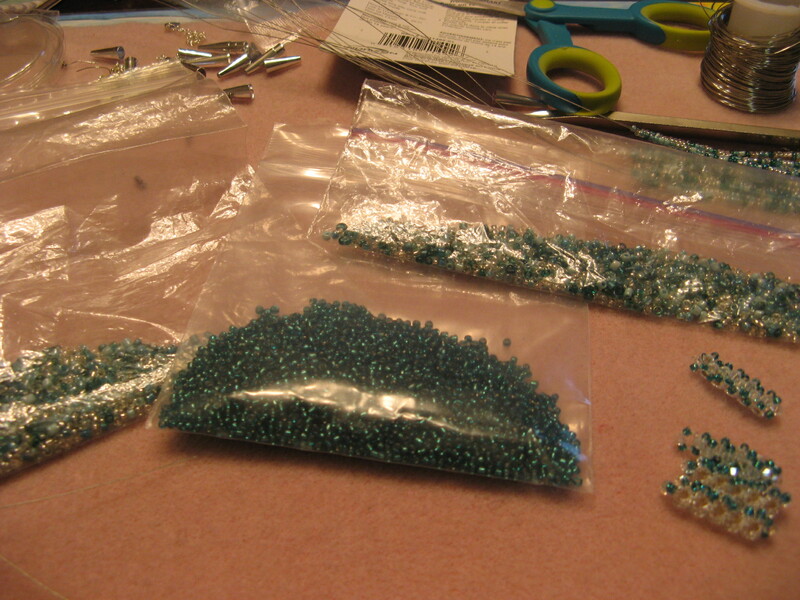 I made the spacer bars by using a ladder stitch to stitch together 5 4mm cube beads and then embellishing them with teal seed beads and Swarovski 3mm bicone crystals. AMAZINGLY BEAUTIFUL!!! I love the color combination and your dedication to the project. Not sure I would have had so much patience to even deal with all the beads…LOL.